^ a b c d e f g Shuk Man, C. & Ng Wai Chuen (Grouper & Wrasse Specialist Group). 2006. Epinephelus lanceolatus. The IUCN Red List of Threatened Species 2006: e.T7858A12856033. doi:10.2305/IUCN.UK.2006.RLTS.T7858A12856033.en. Downloaded on 27 November 2017. ^ a b c d e f Froese, R. and D. Pauly. Editors. 2017. 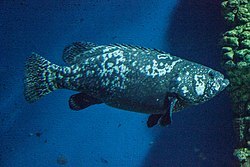 Epinephelus lanceolatus. FishBase. World Wide Web electronic publication. http://www.fishbase.org, version (10/2017). ^ a b c 竹本淳史 (2012-04-01). “サンゴ礁の巨大魚 タマカイ”. 広報誌「南ぬ風」 (沖縄美ら島財団): 15. https://churashima.okinawa/userfiles/files/topics/kouhoushi/vol023.pdf 2018年5月27日閲覧。.